First slice your vegetables, and rinse your beans. Place onion and peppers in a pan or skillet with liquid smoke (I used cast iron) on medium heat and cook for about 3 minutes. Add chili beans and kidney beans, along with 1/4 cup of water. Add in the chili powder and garlic powder. Stir well. Let cook until the water is evaporated and the mixture is thick. Turn off heat and set aside. 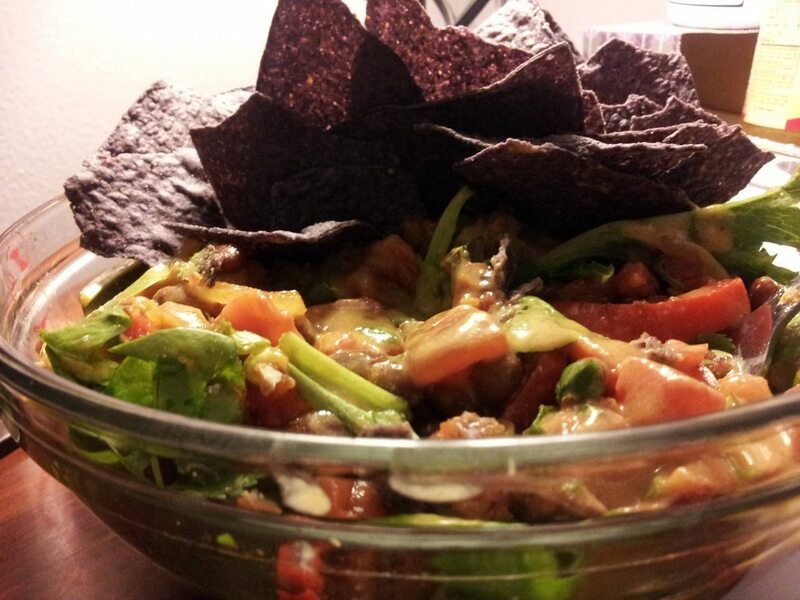 Get a regular sized bowl and mix together diced tomatoes, cilantro and scallions. Set aside. Make your cheese sauce by mixing together all of the dry ingredients in a 2 qt. pan. Mix in water and stir on medium heat until it turns thick. Once thickened, add in Earth Balance and Rotel. Once thickened to your liking, remove from heat. Now mix get a serving bowl and place your chopped/shredded lettuce and spinach in it. Add on your vegetable and bean mixture, cilantro and scallion mixture, salsa, olives, jalapeños, corn or any other add-in you are using. Top everything off with your cheese sauce and serve with chips of your choice. Thanks for taking your time, energy, and love to post all of these.